Babs Young has been in Charlevoix and brought us a souvenir. She writes: The 54th Charlevoix Waterfront Art Fair was held last Saturday in East Park in Charlevoix. As you can see lots of people made their way to the fair and it was excellent as usual. Some of my artist friends who were exhibiting said sales were good. Perhaps this bodes well for a general uptick in the economy. I’m going to believe so anyway, because it’s a cheering thought. 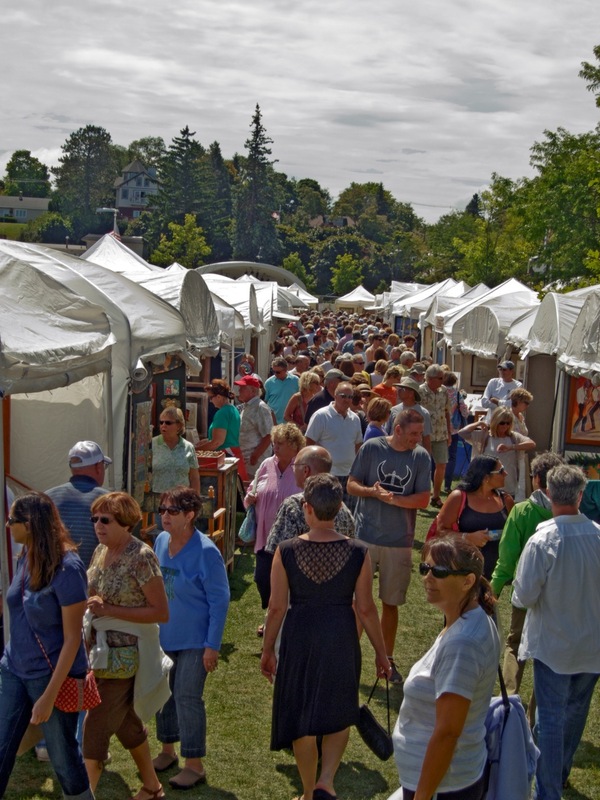 For those of you who are saying to yourselves, Wait, Wait – didn’t we see something about the Charlevoix Art Fair earlier this summer? – well, yes. But there are many Charlevoix Art Fairs in the summer – and there will be another as part of the Apple Festival in October. It is a very arts-friendly community. My goodness, do I love that dress that appears to be denim with a lattice back. I love seeing such a big crowd, too. We’re in a bit of a hiatus here, as it’s too blamed hot in August for anything. Even the bay’s pretty much empty. When it’s too hot to go sailing, it’s too hot for an art festival. Come September/October, we’ll get with the program. In the meantime, I’m glad to hear sales were happening. It’s hard enough for artists in the good times. Isn’t that the truth. On the other hand, there’s something about Interesting Times that can bring out the best in art. I liked that dress, too. I’ll bet the woman wearing it bought some good things. Like bridges, you can’t have too many art fairs. I look forward to a picture on your blog. I have looked for one in the archives, but can’t find it. I will go and take one for you. LOVE seeing a well attended Art Fair! Looks like a lot of people had fun and hopefully some artists made a few sales too. Well look who’s in town! Virtually of course. Thank you for the good wishes for the artists. Art needs good wishes. That photo really gives the idea of CROWD! Crowds under clouds? Since you didn’t mention rain, I’m assuming it gave everyone a break and held off. But now it’s Monday. It can rain. We need rain! Still no rain. Clouds, breezy little bits of wind, and that sense that it’s going to rain any minute now . . . but no rain. We need rain, too. Ah well. DARN. I always want to go to this one and I never get there. Looks great! There’s always Apple Festival . . .
My, it has been awhile since I’ve been to an art fair! I so enjoy art fairs and all the different kinds of creative expressions… and even some quirks. That is a great shot with an almost bird’s eye view of people deep and tents. I agree with Linda about that dress. Hello Anna! I’m glad you enjoyed Babs’s take on the art fair. I liked it too–and the dress. Once upon a time I could have worn a dress like that. This is a great picture to give you the feel of a happy day at an Art fair.I would have loved to be there too. This lady in black seems to attract everyone’s eyes. Wonder what she bought ? There seems to be a nice house up on the hill with a kind of turret on the roof. Unusual. On behalf of Babs, thank you. There are a lot of unusual houses in and around Charlevoix. One day we may have to do an entire gallery of them.